They’re back! 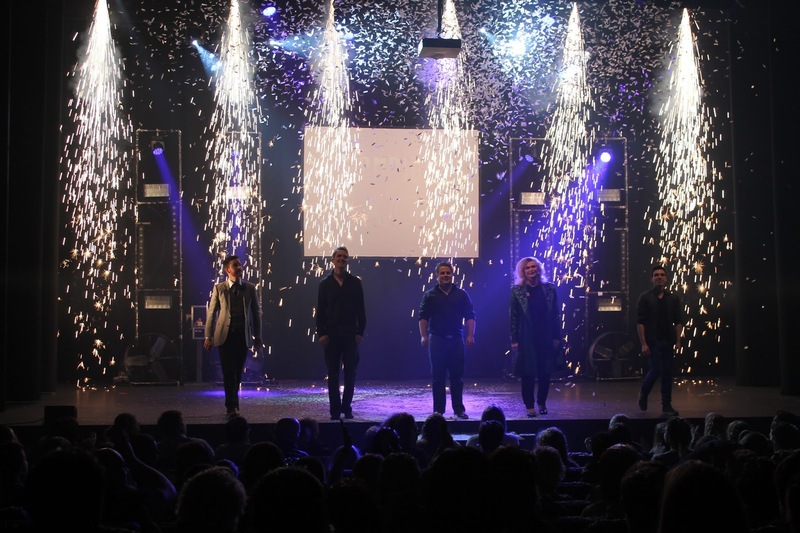 Direct from a hit run in London’s West End, the UK’s leading band of mind-blowing illusionists and magicians take to the road for the fourth year running to once again perplex, astound and thrill audiences all over the country. In April grand illusionists YOUNG & STRANGE (ITV’s The Next Great Magician), master mind reader ALEX McALEER, award-winning Queen of close-up FAY PRESTO, and ‘International Stage Magician of the Year’ EDWARD HILSUM will be performing incredible feats of mind-reading, stunning close-up, daring large-scale illusions and a death-defying, heart stopping finale. So if you like your magic big, bold and baffling, this is the show for you. 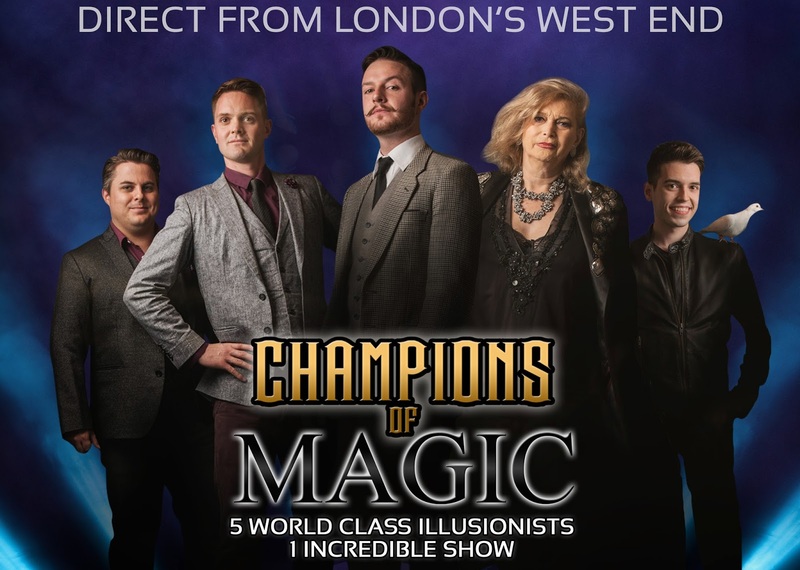 Producer Alex Jarrett said: “We’re very excited to be taking the Champions Of Magic show around the UK for our longest tour yet. 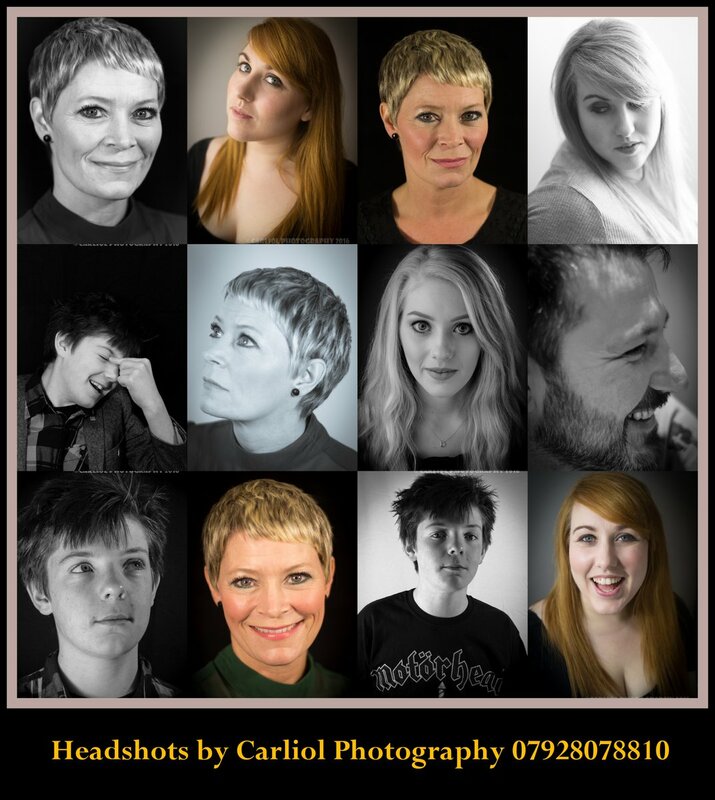 Following a great run in the West End, the cast and crew are excited to get back on the road and present a great night out for the whole family. You really don’t want to miss it!”. Q: This is your fourth national tour together with ‘Champions Of Magic’. What would you say was the secret of your success? Alex: Each member of the cast is showcasing their particular speciality in the field of magic, be it mind reading, close-up magic, or grand illusions, so audiences are not seeing us all doing the same kind of thing; there's a real variety to the show. I think that’s the key; it makes the show appeal to a broad range of people; young, old, families and friends on a night out to the theatre. Edward: I think the real secret is the power of theatre magic. I've performed illusions on television and radio, but there is nothing quite like the moment of astonishment that we all feel when we experience magic live. Fay: The show is a true meeting of equals. Each performer is working at the peak of their own expertise, and the stage crew and technicians are a joy to work with. Alex: We all have a genuine respect for each other’s acts and what we each bring to the show. Every time we go on tour it's like a group of old friends or family coming together. 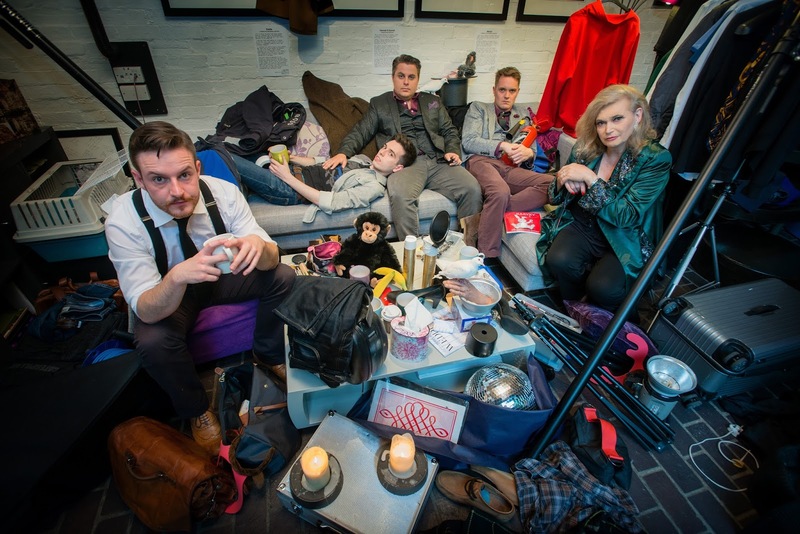 Fay: We have a respect for each other’s disciplines, Ed’s manipulations are as tight as they could possibly be, Richard and Sam’s illusions are both slick and witty and their sense of fun is true both on and off the stage. If anybody is going to get inside my head and walk around, I want it to be Alex McAleer. Alex: Young and Strange gaffer tapping Edward Hilsum to a wall back stage. Fay Presto saving the day by performing in the street after an errant fire alarm meant the audience had to evacuate the theatre. Edward: Every show has been memorable because all audiences are different. But I'll never forget when I opened the very first show, a huge pyro went off above me and although I was expecting it, the size of the explosion really took me by surprise! The effects in the show are just as exciting for us as they are for the audience. Fay: The Night in Jersey that Marcus, who was helping me with the act, went down on one knee and proposed to his Katie, the day two years later entertained at their wedding. Alex: I don't think it ever went away but more recently people have remembered that magic is something to experience live. I think people know that what they see on TV or YouTube might not be the whole picture so the more opportunities they have to see it live the better. Edward: There are some fantastic TV shows which have taken magic to a larger audience so more people now want to see it live. But I also think that in the current Information Age, where the answer to most questions is available instantly online, we all crave that sense of wonder that comes from a real mystery. Fay: There is so much that can be created ‘digitally’ these days, to see something you cannot explain ‘live’ and in the flesh, unfiltered by the tricks that can be played with video and transmission through television and computer is very special. Often live music is slightly diminished by the live experience, magic is enhanced by it. Edward: I've wanted to be a magician for so long now that I really can't imagine doing anything else. But I'm genuinely interested in other people. I got a first class degree in Psychology at university, so I'm sure that if I had to do something else, it would still be something that involves interacting with people and I'd find a way to use my magic skills! Fay: I never expected to be a magician, nor even a performer. It was rather forced upon me by the necessity I found at the age of 35 to eat and pay the rent. Alex: Probably the first piece of mind reading I ever learnt was a skill known as 'muscle reading' - I had a friend hide an object somewhere in the house and then asked them to think about its location until I found it. Took me about two minutes. It's a bit like a game of 'hot or cold' but they only think about where it is, saying nothing aloud. Edward: The first trick I mastered was making a lollipop appear! I first impressed my mum and dad, but the best audience was my school friends, who of course wouldn't let me stop! Fay: Not sure I’ve mastered anything yet, still working on that one. Even so the list of those I have somehow impressed is embarrassingly long. Edward: When I was about six years-old, I wanted to make the Wicked Witch in The Wizard of Oz disappear. I'm still working on it. Fay: Another embarrassingly long list I’m afraid. Young & Strange: Aspiring young magicians. Our position on this show is dubious at the best of times and it would only take some younger act to meet with the producer. It wouldn’t be long before we are back in Sainsburys filling donuts with the correct amount of jam. Edward: Philippe Petit. He is a high wire walker with a remarkable story. He accomplished many amazing things, including secretly setting up a wire and walking between the Twin Towers of the World Trade Centre in 1974, with no safety net. His creativity, bravery and determination are a constant source of inspiration. He's an expert at sleight of hand too! Fay: The entire cast of the Old Players Music Hall Company. Edward:Even after hundreds of performances, little things do occasionally go wrong. But it's my job to make sure that the audience never knows… So I'm not telling and neither are the doves! Edward: I enjoy reading, watching movies and pranking Young & Strange. Young & Strange: We spend time devising ways to distract Ed Hilsum. Edward: You won't believe your eyes! Fay: Most fun I ever had. Young & Strange: PERFECT show title. With exceptions. 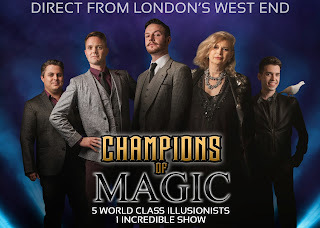 Official website: www.championsofmagic.co.uk for full tour details.